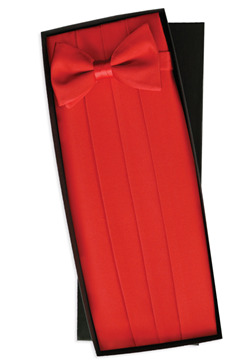 This Tuxedo Park Red Bow Tie and Cummerbund set is new merchandise. Both the Bow Tie and Cummerbund are fashioned from solid 100% Silk and feature adjustable hook closures. The Cummerbund fits a man's waist sizes 28" - 48". The Bow Tie adjusts to accommodate a neck measurement of 19". Considered by many to be the most elegant formal accessories, this Cummerbund and Bow Tie combination is sure to have you looking your best!